These Lick Tanks are designed for dispensing liquid feed supplements to livestock. Tanks are equipped with rotary dispensing wheels and fill port. Lick Tanks are manufactured from low-density polyethylene with U.V. inhibitors and designed for containment of liquids of up to 1.5 specific gravity. Tank walls are translucent for level viewing and equipped with gallon indicators. Wheels sold separately. Mineral Feeders feature a heavy metal base and pivot system to prevent mineral loss in wind. 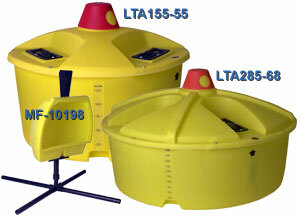 Polyethylene feeder housing is corrosion resistant with U.V. inhibitors. Feeder capacity is 100 lbs. and is U.S.D.A. compliant.